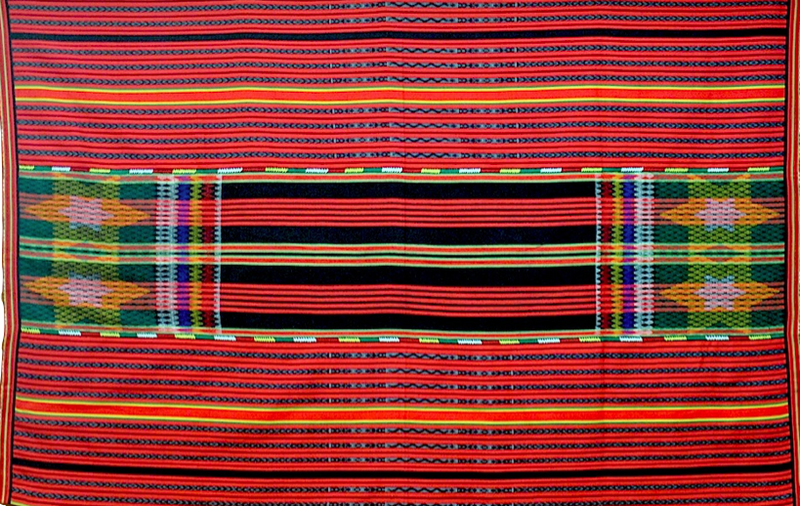 The uwes pinakawha is one of the most elaborately designed funerary blankets of the Bontocs. This was once wrapped around a dead person of high rank but with the advent of Christianity this is now usually folded and placed inside the coffin. There are three panels that are stitched together. The pa-ikid are the side panels occupying the upper and lower portions. The pakhawa is the center field. The blanket as a whole has reflectional symmetries across vertical and horizontal axes, such that its upper and lower halves, as well as its right and left halves are images of each other. The pakhawa is adorned with a planar pattern consisting of matmata motifs and friezes with tiktiko motifs. 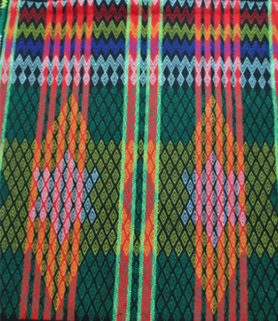 The matmata done in supplementary weft, are colored white, yellow and green; the white and yellow threads are used to highlight the bituwon (stars).The effect is an elaborate star design that appears on both ends of the pakhawa, joined together by red woven parallel lines that run through the center. As one can observe, one of the friezes combine a tiktiko and a double lined matmata to denote figures of arrowheads or spears, referred to as shukyong by the Bontocs, to symbolize protection. The frieze patterns consisting of tiktiko motifs has symmetry group m1. Its symmetries consist of reflections with vertical axes passing through the center of each tiktiko and translations. A frieze has symmetries that include reflections with vertical axes that pass through the center of each tiktiko motif and the center of each matmata; and a reflection with horizontal axis also passing through the same centers. There are also rotations with centers located at points of intersection of the reflection axes. The symmetry group of the frieze pattern is mm.